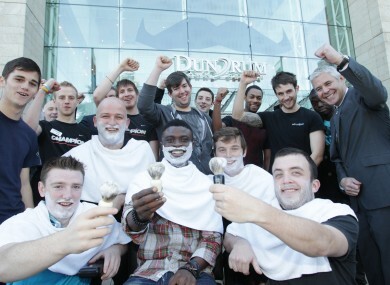 Mo bros in Dundrum last November. THE MOUSTACHIOED MEN who embraced Movember last year are to thank for a new fund being set up for cancer research. The Irish Cancer Society, in collaboration with the Movember Foundation, announced the new award today, saying the fund “has the potential to realise breakthroughs and transform current prostate cancer care”. The society also awarded €350,000 in funding, which was made possible with Movember funds, to Molecular Medicine Ireland led by Consultant Urologist, Dr David Galvin. This money will be used to establish the first Irish Prostate Cancer Outcomes Research (IPCOR) in Ireland that will monitor, benchmark and publicly report annually on outcomes of prostate cancer treatment and care. Dr Galvin is the chairperson and clinical lead of the Prostate Cancer Committee, National Cancer Control Programme (NCCP). If there is satisfactory reporting, funding for a further four years will be made available. That would bring the total IPCOR fund to €1.75million over five years. The Prostate Cancer Transformative Programme grant is worth €750,000 over two years and has been awarded to the Irish Programme for Stratified Prostate Cancer Therapy (iPROSPECT). It is led by consultant medical oncologist, Dr Ray McDermott, and its connected projects are all integrated “to bring about a transformation from current practice to a more individual and personalised treatment of patients with metastatic prostate cancer in order to improve patient outcomes”. Head of Research at the Irish Cancer Society, Professor John Fitzpatrick said the announcement “is an exciting opportunity for the prostate cancer research community in Ireland”. The Irish Cancer Society has contributed more than €30 million to cancer research since 1963. In Ireland, the number of prostate cancers diagnosed has increased from 1,162 in 1995 to 3,122 in 2010, while the number of deaths is just over 500 per year. Email “Movember moustaches fund groundbreaking prostate cancer research”. Feedback on “Movember moustaches fund groundbreaking prostate cancer research”.